The DeLonghi CTOM4003.BK Toaster 4 Slice 1800W in black is the perfect appliance that will help feed all the family quickly in the morning. The 4 slice operation ensures that you can toast twice as much and the dual independent controls enable you to toast two different sets of snacks at different browning levels ensuring that everyone gets their snack exactly how they want. 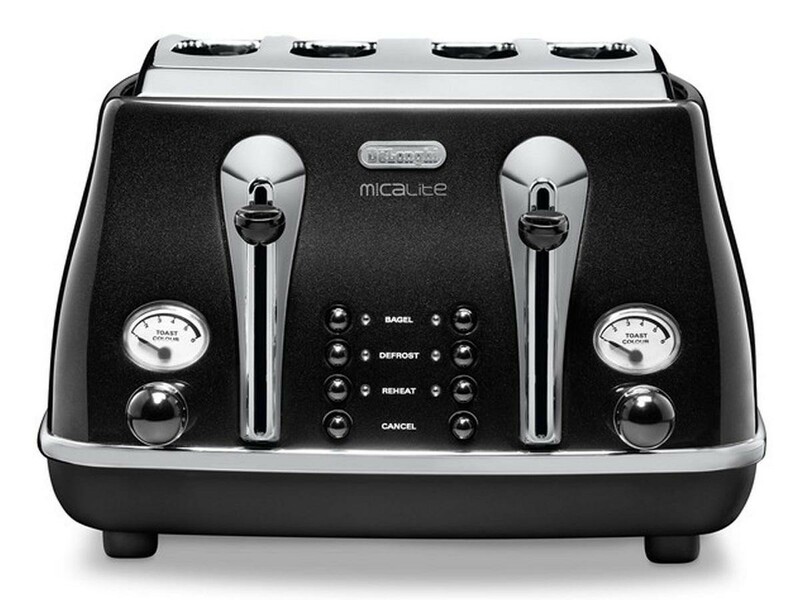 The electronic controls give you various other functions, the bagel function will toast one side of the bagel while only warming the other and the reheat function will warm up your already toasted snack without burning it, the cancel function will cancel the cycle even if it's in the middle of the cycle and the defrost function allows you to toast frozen bread. The wide slots allow you to easily fit your wider snack inside and the high lift helps you to effortlessly remove smaller snacks. The removable crumb trays keep your worktops tidy by collecting any crumbs in a hidden compartment then can easily be removed and emptied and the non-slip feet keep the toaster steady.